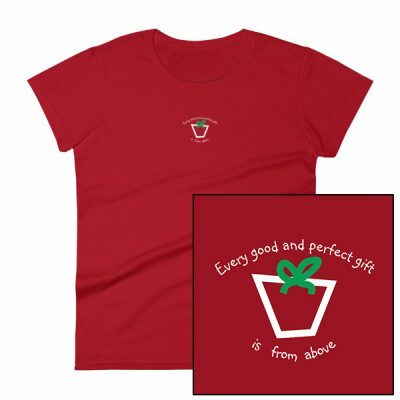 "These quality inspirational shirts make wonderful gifts, keeping bodies and souls warm." "Excellent quality, Christian message is subtle, not overbearing; price very good and customer service first rate. I recommend to anyone." "I have always been a wearer of tee shirts. The Litttle Light tee shirt is not only a quality shirt, but it has a message which is special and unique to each wearer." "A friend of mine gave me a t -shirt at one of my retreats. This t- shirt is one of the most comfortable shirts I have ever worn. Extremely soft and light weight. I also like the fit around my neck. It is not a tight fit, even after many washings the soft fabric remained. I would definitely buy this as gift for family and friends." I received my shirt as a gift at a retreat. What a nice surprise! It is inspirational to wear a Biblical quote. It makes you feel good and hopefully will rub off on others as you are wearing it. Comfortable and cotton. Fits well. I highly recommend their t-shirts." "The Litttle Light shirts that I own are made of soft, 100% high quality cotton, and wear very well. My favorite of these tee shirts has the message, "In God We Trust" written on it and I have been asked by several people where I got it."